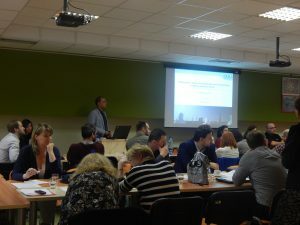 In April 2018 a workshop entitled “Practical experience from contaminated sites remediation – II” was organised at Comenius University in Bratislava, Slovakia. It focused on the legislation in the area of contaminated sites, environmental loads and remediation, and also on principles of risk assessment in the process of risk analysis required by the new Ministerial Decree. Practical experience from the contaminated sites surveys, monitoring and remediation was included in several presentations. The workshop was co-organized by the Slovak Association of Hydrogeologists, the Slovak National IAH Chapter and scientists from the Department of Hydrogeology, Faculty of Natural Sciences, Comenius University Bratislava and the EPS Slovensko company. It was attended by 80 participants.